Using a walker safely: How do I use my wheeled walker (rollator) safely? How do I use my wheeled walker (rollator) safely? Do I need a therapist to buy a walker? There are four main activities that you need to perform safely when using your walker. These are: standing up, walking, turning, and sitting down. The following are general guidelines and are not appropriate for everybody. You are strongly encouraged to seek guidance from a therapist for your unique situation. Move forward and sit as close to the edge of the chair as you feel comfortable. Keep your feet as far under you as possible. Aim to place your toes directly below the edge of the chair. Place both hands on the arms/seat of your chair OR one hand on the chair and one hand on the walker. Do not tip the walker by placing too much weight on one side of the walker as you stand. Lean forward until you feel some of your weight on your feet. Use your legs to stand as much as possible – your arms should only lift what your legs cannot. Use your arms mostly to help keep your balance as you stand. Do not walk forward until you have tested your balance and you feel strong enough to walk. Stand directly in front of the chair, facing away from it. The back of your legs should be almost touching the chair. Do not start to sit until you are balanced and standing still. Reach behind for the chair with both hands (preferred) or with one hand and one hand on the walker. Do not tip the walker by placing too much weight one side as you sit. Slowly lower yourself using your legs as much as you can. Place your walker ahead of you before you take any steps. Gently roll the walker ahead of you as you walk. Keep the walker close enough to you that it is supportive. If your steps are uneven, its best to shorten your longer step rather than work to lengthen your shorter step. The shorter step is usually the step where you have less balance. To turn around: stay within the width of the walker even if you are slightly behind. 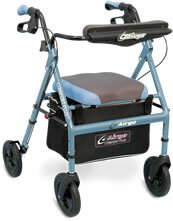 Roll the walker around you without twisting your back – you should always be facing the front of the walker. When standing in the kitchen and bathroom: use the counters for your support rather than the walker – but keep the walker within reach. You’ll need to consider much more than physical ability. What about the environment and social supports? And if so, how do you find a therapist? We have a number of associations you may contact. You have options and we have recommendations. There is also financial assistance available to you. From basic activities to common mistakes, here’s a guide to help you use your non-wheeled walker or wheeled walker safely and effectively. Commonly given answers. Feel free to contact us if you’d like to contribute and help others. Professionally prepared resources that offer guidance to a successful thought process based on past experiences. Many thanks to these companies for sponsoring Walker Facts. It's their support that keeps this resource free to everyone. Does My Walker Fit Me? Do I need a Therapist to Buy a Walker? How a Therapist Can Assist Me? How Do I Find a Therapist? Where Do I Buy a Walker? and all those who have contributed to this site. Help make our site better! Feel free to submit case studies and additional content here.